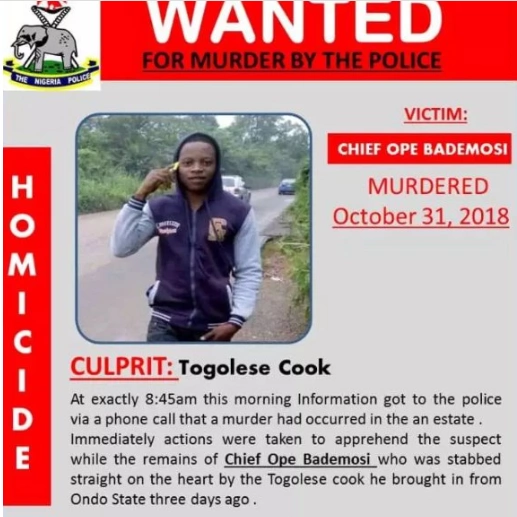 A Benin republic soldier who came to Nigeria under the guise of working as a cook has murdered Lagos-based millionaire, Chief Ope Bademosi. The founder of Credit Switch Technology was brutally stabbed to death in his house in Ikoyi Lagos in the wee hours of Wednesday the 31st of October 2018. A witness told Lagos Homicide investigation officer the the suspect who was brought into Lagos from Ondo state on Sunday abandoned the knife he used in the murder and fled. A search of his bag later revealed that he could be a soldier who came to Nigeria for robbery. After killing his victim, he ransacked the whole apartment and carted away all valuables he could lay his hands on including an unaccountable sum of money, jewelries and the deceased phone before he fled to an unknown destination. The suspect simply identified as Sunday was hired without proper background check. Nobody knows his relations or friends. Here is what a witness told Homicide detectives.